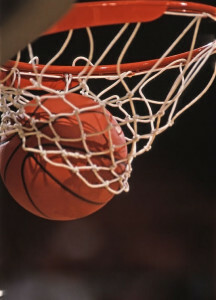 Welcome to the first game of the Final Four of my investing strategies tournament. 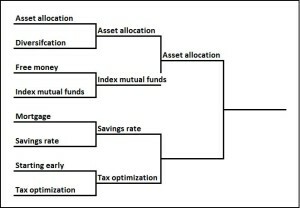 Here we have Asset allocation taking on Index mutual funds. In the first round, Asset allocation blew out Diversifying mostly due to the higher returns that younger investors can get by investing more in stocks early in their investing career. Index mutual funds upset Free money on the strength of lower management fees that can apply throughout an investor’s career and across every account type. As always, check out the disclaimer. With that out of the way, let’s see who wins. Last round we saw how being too conservative with Asset allocation can really reduce the returns of younger investors who aren’t as heavily invested in stocks as they should be. If you go to the other end of the investor’s time horizon, when he or she is older and nearing retirement, you can make equally harmful mistakes. On one end of the spectrum older investors can become way too risky. As the years tick by and people get closer to retirement, they begin to take stock (pun intended) of where they are probably a little more closely than they did in their 20s or 30s. If they aren’t quite where they want to be, knowing that on average stocks have higher returns than bonds, one natural response is to allocate more of their nestegg to stocks to “catch up”. According to generally accepted investing theory, this is the exact wrong thing to do—as we get closer to retirement you should be reducing your allocation of stocks to lower your risk, not increase it. Here you’re stepping away from the world of investing and into the world of gambling. Maybe you’ll get lucky and ride a bull market up to get your portfolio back to where you want it, but you’re definitely putting yourself at risk of hitting a market pothole and putting yourself further behind. On the other end of the spectrum, they can become way too conservative. Some people have the natural instinct to want to get completely off the investing train in retirement because they don’t want to have any risk, so they put all their money in bonds or cash. This is understandable because they’re going to be depending on that nestegg, so it’s got to last. But the problem is that even in retirement, many people still need the higher returns that stocks provide to balance out the relative safety of their bonds. This is especially true in a world where people are living longer and it’s not unreasonable to expect retirement to last a few decades or longer. And actually, that time element also makes the case for stocks being a significant part of your retirement portfolio—you have time to ride out the storms, just not as much time as you had before. These are what make Asset allocation one of the harder investing strategies to get right, because it’s changing over time and there are shades of grey (at least 50 shades of grey). Other strategies like Diversification and Free money are much simpler because your strategy is absolute. Diversification—you should be diversified at all times. Free money—you should get as much of it as you can at all times. But with Asset allocation, the right thing to do gradually changes from being mostly in stocks during your early years, and then slowly switching to more bonds and cash as you start to near retirement, but never shifting completely to bonds. There’s no strict rule on what your Asset allocation should be at different stages of life, but I always look at Vanguard target retirement funds as a bit of a guide (although I’ll write about some of my issues with these types funds in a future post). With 40 years until retirement, right around when you’re first starting out, Vanguard suggests about 90% stocks and 10% in bonds. Once you hit retirement Vanguard suggests 40% stocks and 60% bonds. Notice that even in retirement a very significant portion is still in stocks. So what does that all mean? Well early on Asset allocation done properly can get you higher returns over the long run, historically about 3-4% higher than if you completely screwed it up. Later on, it’s going to help protect you from any market crashes, market corrections, or general market zaniness that occurs. We know from the Elite Eight round, that one of the major advantages of Index mutual funds is their lower management fees, which are on average about 1% less than actively managed mutual funds. We also know from The power of a single percentage that saving 1% of your portfolio year after year can lead to some serious ducats (I’ve decided to use as many slang terms for money over the next few posts, so prepare yourself). But we’re in the Final Four now so we need something more than that. Not above a little chicanery, Index mutual funds is going to steal a page from Asset allocation’s playbook. Often with actively managed funds, they keep a significant portion of the fund’s assets in cash so they can buy an investment when the opportunity presents itself. Of course we know from above that holding cash over the long term leads to lower returns than holding stocks. Index mutual funds are able to be almost 100% invested in stocks (or whatever asset class you want) because they aren’t picking investments so much as just following the index. Just doing some simple math, if actively managed funds have 5% of their assets in cash, and over the long term stocks return 6% more than cash let’s say, that comes to a long term benefit of about 0.3% (5% x 6%). That’s not going to change the world, but even those little bits compounded over decades can make a huge difference. 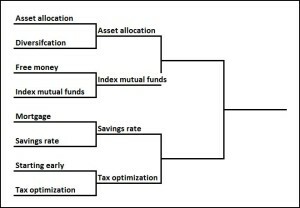 Index mutual funds is also copying Tax optimization. When your mutual fund sells shares there are tax implications on that (death and taxes, baby). That’s why you get that statement every year from your mutual fund telling you what you need to report to the IRS. The more frequently your mutual fund trades stocks, the more likely it is that you’ll have short term gains which are taxed at higher rates. But with Index mutual funds, trading is minimized because the fund is only following an index like the S&P 500 which doesn’t change that often. That leads to lower taxes which we know can add up to some serious cheddar (see, I did it again). There are also people who argue that Index mutual funds do better than actively managed funds because they take the human element out of it. This is pretty controversial, and if you believe in the theories from A Random Walk Down Wall Street, which I unabashedly do, then shouldn’t active managers do just as well as a passive index? Hmmm, that sounds like fodder for another post. People debate this all the time and I’m not convinced that this really drives the needle. The final major benefit of Index mutual funds is that they’re super easy, especially compared to some of the more difficult investing strategies like Asset allocation. You can go to a place like Vanguard (that’s where the Fox family’s money is) or Fidelity or a dozen other places and sign up for one of their index funds, then as Ron Popeil says, “you set it and forget it.” That means you’re getting pretty incredible value for a relatively small amount of work. Index mutual funds pulled out all the stops, but in the end Asset allocation was just too strong. Index mutual funds will definitely help build your nestegg, probably juicing your returns 1% compared to actively managed funds and maybe even 1.5% if you’re feeling charitable. That’s nothing to sneeze at, but we’re talking about punching your ticket to the Championship round here, people. Let’s say you completely abandoned the idea of Index mutual funds and went totally with actively managed funds. How bad would that be? It wouldn’t be ideal (just my opinion and one not shared by my good friend Mike), but you’d be fine in the end. Actually this is what millions of people do all the time and it tends to work out. With Asset allocation the stakes are just too high. I have Asset allocation pulling away, 68-59. Be sure to come back tomorrow to see who they take on in the final, either Savings rate or Tax optimization.